Miners Hollow is a fun canyon between Quandary Canyon and the Muddy River Gorge in the southern part of the San Rafael Swell. Although not as difficult or as long as Quandary Canyon which lies just to the east, it is still an awesome outing offering history, potholes and stunning scenery. This canyon is one where you want to make sure you know whether or not all the potholes are filled with water or not. Miners Hollow is a completely different canyon when filled with water. This area was one of the richest Uranium mines back in the days of the Utah Mining boom in the 1950's. This was a time when Uranium was in high demand due to World War II and Miners did some pretty incredible things at Hidden Splendor to try to get it. One on the most notable was the road they constructed and blasted out of the reef that started where the old Ford sits and went up and over the reef into upper Quandary Canyon. Many other roads were plowed out of the steep talus all around the backside of the reef. Miners also had drilling equipment helicoptered up to the to of the reef which included thousands of feet of metal pipe to pump water up from Muddy River. A small mining shed with a large wood stove is along with drill hole remains are found at the upper end of both Quandary Canyon and Miners Hollow. As you work your way through Quandary Canyon, you will hike on this old road, see remnants of blasting and pass a drill hole with old mining equipment. If you continue west towards Miners Hollow, you will come across a long pipeline that at one point pumped water 1,400 feet up from the river below. Some people get very angry when they see mining remnants in a beautiful place like this however I see it as an interesting side trip where I take myself back in time and wonder what it was like during those days. Being a geologist myself I kind of enjoy seeing these things in such remote places. It puts things into perspective to realize that these areas are only very recently used for recreation. Not too long ago no one ever came to these parts and the ones who did were there for long periods of time living in hardship in the mines or as outlaws. Now we go to these areas only a few days at a time for fun. A lot has changed in a very short period of time. The Hidden Splendor closed in the late 50's when the US government quit subsidizing the Uranium boom and most of the mines in the area closed with most of the equipment deserted. Another big mine in the San Rafael Swell was the Temple Mountain mine at at Temple Junction there was once a small town with a saloon and a post office. Today, only the foundations remain of this place. Turning off Highway 24 onto the Temple Mountain Road towards Goblin Valley, take a few minutes to roam around the foundations located on the southwest side of the intersection. More recently, the San Rafael Swell may be the home of more activity as the BLM just leased section of the Swell near the Head of Sinbad and Eagle Canyon where I-70 cuts through. Within the next few years, natural gas wells will likely be found in the center of the Swell and the area will once again be active. Since the swell is basically a huge anticline, the apex of the fold makes an excellent natural gas trap and there is potentially a very large reserve of methane under the center of the swell. Climbers and canyoneers with a keen eye will notice the Wingate sandstone which makes the steep cliffs along the back side of the reef aren't as red colored as the Wingate around Moab and Canyonlands National Park. Actually, the Navajo (which is typically white) and the Wingate are hard to differentiate in the San Rafael Swell which is a result of natural gas leeching much of the iron oxide that is usually found in the Wingate Sandstone. 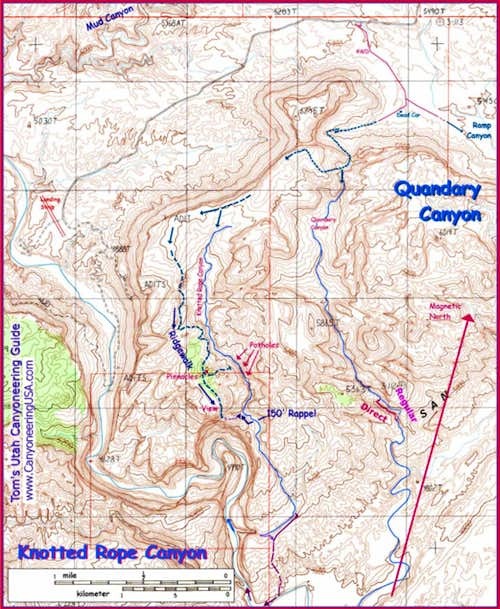 The canyon starts near the historic Hidden Splendor Mine at the southern end of the San Rafael Swell. To get there, stop at the small town of Green River, Utah and make sure your gas tank is full. From there drive west on I-70 about 29 miles and take exit number 131. Turn left off the offramp (or right if coming from the west), and continue on the very high quality frontage road that parallels the freeway for a short distance then turns south. Follow this very good dirt road for 10 miles to a junction. All the junctions are well signed in this part of the swell and all the roads needed to get to Hidden Splendor are good. At the first junction, veer right and go another 4 miles to another junction in which you will turn right. If you follow the signs for Hidden Splendor, you can't mess up! Go 1 mile and take a left at the road leading towards Hidden Splendor Mine and McKay Flat (heading right at this junction will take you down Reds Canyon). Now go 8 miles and take another left onto the road going down to Hidden Splendor Mine. This road is 10 miles long and ends at the mine in the middle of nowhere. This road is a little rougher and has a couple places that could ruin your low clearance car but driven carefully, all cars can make it. To get to the Old Ford, turn left onto a side road 3 miles before reaching Hidden Splendor and drive this narrow track about a half mile to the old blue 1950's Ford car where there is room for a handful of cars. A high clearance vehicle is likely required to drive this final half mile otherwise you'll have to park along the Hidden Splendor road at the junction with this short road. Where the old car sits is where the hike officially starts. There is also a sign posted that says "Quandary Canyon foot trail"
This canyon is rated 3B III on the ACA Canyoneering scale which means it has intermediate technical canyoneering and typically always has standing water in the potholes. From your parking spot, start hiking towards the reef following a small wash or an old mining road. You will pass by Sy Butte to your right that glistens beautifully in the morning sun. Work your way up through the boulders until you get very close to the base of the large Wingate cliffs where the old road will be more apparent. Follow this road until you get to the pass that was blasted out of the Wingate cliffs to allow vehicles through. At this notch you are standing at the very head of the Quandary Canyon drainage. Descend into the very upper reaches of Quandary canyon and follow the dry wash for a short distance. After about 200 meters in this dry wash you will notice a steep talus slope going up to your right with two very large rocks at the top. Veer right out of the dry wash and start climbing up this talus. The slope goes up about 400 feet where many rocks are loose so be careful not to jar any loose on your friends below! As you near the top you will come across two or three very large rocks that seem to block the way. Go around these to the left and you will see a crack underneath them. Work your way through this crack with some class 3 scrambling and emerge at the top. From here, walk due east working your way towards the top of the cliffs you saw above you at the Hidden Splendor Mine. Take a little extra time and walk to the edge and take in the beautiful views to the north. Continue to the southwest around and to the north of a couple Navajo sandstone knobs and drop into upper Miners Hollow. You will pass over a long metal pipe on the way and if you search hard enough you'll find the old cabin and wood stove used by the miners in the 50's. Once you enter the drainage, continue down the easy wash bottom for 15 minutes or so then just as the canyon narrows, you will come across the first pothole. This first pothole can be traversed around on the right side. Beyond this, climb up on the left side of the canyon bottom to bypass a few more small potholes and descend slabs back to the bottom and make an 8 foot slide down. After this slide, you will be unable to bypass the next 5-10 potholes. If they are all full of water, they are all easy wades with a couple being full swimmers. A wetsuit is mandatory unless it's mid-summer. If the potholes are dry, there are 2 keeper type potholes where pothole escape techniques are required to escape. The first of these keeper potholes is a 10 foot deep pothole which has claimed the life of a woman who fell inside trying to traverse around it and broke her arm. She subsequently froze to death when her husband went off to find help. Go prepared! Once you pass the final pothole, the canyon opens up where you can hike on the slickrock above the canyon bottom to avoid many small potholes. Descend down this slickrock valley passing a large cottonwood tree and locate a trail climbing 50 feet out of the now open wash to the left side and up to the top of the Carmel rim. Here the canyon taken a sharp right turn and soon drops into the Muddy River Gorge via a 280 foot rappel with a poor anchor. It's best to avoid making this long free hanging rappel due to the poor anchor situation and the fact you would need to carry 100 pounds of rope through the canyon! Taking this trail along the Carmel rim and down the slopes of the San Rafael Reef bypasses this rappel. Descend down to the Muddy River then begin hiking up the gorge. Once through the gorge, pass the Hidden Splendor mine ruins and hike up the old road back to camp. Bring a wetsuit and at minimum have basic pothole escape gear. If the two keeper potholes are empty, you cam probably do a shoulder stand and help one another out but it's best to have some extra gear. This entire area lies on BLM lands...practice "Leave No Trace" practices. You can camp anywhere you want. There is excellent camping all around the Hidden Splendor mine but don't camp on the airstrip as private planes do use it. No motorized travel is allowed in the nearby Wilderness Study Areas.